Small Business Book Award Winners. The fourth annual Small Business Book Awards highlights the best new Small Business books specifically beneficial for small businesses rather than applicable only or primarily to enterprise or corporate level businesses. Small Business Trends – recognized in 2005 and again in 2008 as the winner of the Forbes “Best of the Web” distinction for small business blogs. BizSugar small business social bookmarking, voting, and networking site for small business and medium-sized business owners and managers. Small Business Blogging Community BloggerTone – All three of these sites are dedicated to for Small Business and highly recommended. Ivana Taylor, publisher of DIYMarketers.com and an exceptional writer in her own right. She is co-author of the book “Excel for Marketing Managers.” Do be sure to check out her DIY Marketers blog. Book Site: Become a Franchise Owner! Books distill the wisdom and experience of decades into an easy to consume format; exceptional books provide actionable strategies and a map you can use to guide your small business to greater heights. I highly recommend them as the fast path to success. I was not aware that Olivier Blandchard’s book was in the running when I originally created this post. I thought it had been out too long to qualify so I didn’t think to look for it. I am adding it to my list as he is the only one I have seen writing about how you CAN track Social Media ROI and the impact of other actions by using timelines. No doubt other excellent books have been nominated so feel free to share your favorites or draw attention to your own book in the comments. I did not have time to review ALL the nominations – so your book could end up in this post. Disclosure: Many of the images in this post and the Buy links take you to Biggerbooks – my choice as the best alternative to Amazon. There is NOTHING unethical about a blogger using affiliate links provided they only recommend what they truly believe in. I do not support, buy from, or recommend the highly unethical Amazon.com. I have received free review copies of some of these books. Two years later, and the book I\’ve recommended most often and still recommend is \”Get Recommended… for why see How to Get Recommended: Recommendations ARE WHAT WORKS to Grow Your Small Business or Blog. WoW this is the huge list of books. Can someone recommends the best one of it? My hat tip goes to Death Came Third. I started to get called on to deliver market thoughts and quite frankly, I don’t think I could keep a concrete thought. This book hammered home about leading with your strengths even if you don’t think you have any. Confidence came as a result of this book and the many tips and suggestions it gave. While not a great speaker, I can at least hold the interest of the room. Good list. Two of my favorite (older books) are E-Myth, and the Internet Business Manifesto (free ebook). Both really changed my perspective. The E-Myth Revisited: Why Most Small Businesses Don’t Work and What to Do About It – Author(s): Gerber, Michael E.
great recommendation Growmap. There are some very valuable and useful books that relates to my niche. will surely search in details about these books and try some from this fantastic collection. Reliable resources for business start ups and I’d say, that’s such a brave post. I recently developed interest in reading and must admit that books have the power to change the life of anyone. From being a pessimistic person I am started seeing the positive sides of things now. I just loved reading the book ‘And the death came third’. This book is aimed at people who are attending business networking meeting where they will meet a lot of people in a short period of time to see if there is a chance of doing business together. However the tips are equally as useful if you’re going to a party or wedding where you know very few people. The difference is that people at business networking meetings are looking to sell their product. to see the new info from you. That’s a great list to select from and all are incredible books. I do like to add one of them in my collection. I have been looking for books that would strengthen my motivation. Thank you for your suggestions. This is a pretty good list and the books’ reviews are impressive. Thanks for the list, I like the book “Marketing Shortcuts for the Self-Employed” very much, read before and very useful! Nice collection of small business books! Managing with Conscience is my favorite. In any business, building your employees’ trust and maintaining customers’ loyalty are the core factors to survive in today’s competitive market. Thanks for the list of business books, I have to admit that that is one of my weaknesses. I’d love to hear the story behind “unethical amazon”. This list reminded me a lot of those little books as kids that we got from the library and had to read to increase our knowledge. I must say that you seem to have a great list here. I am hoping to read some of these books and looking forward to gaining useful information that will help me when it comes to my online business. My vote goes to: Duct Tape SEO: WordPress SEO Done Dirt Cheap, but there are many good and useful books on the list. I’ve never heard of any of these books, but I think I’m gonna order that one on SEO… I usually just read the classics for business like Eugene Schwartz and Zig Ziglar. I haven’t heard about the most of these books, but marketing shortcuts is really a must-have one for the people who are in online marketing and SEO. Such a great collection of must.have items, thanks for the inspiration! This is a wonderful list of books. I think I will buy “Managing With A Conscience”. I feel other books will also be helpful but I will buy them after this book gives me good amount of help. Looks like I’ve got a lot of reading to do. The main point is that SEO and inbound marketing is relatively new way of promotion and there’s a lot we haven’t experienced. So we really need to read a lot. This post is is good source of books but might and main is to deeply understand the literature and practically apply these tips in business. I am an avid reader and read books regularly. I must say that is great fun reading books and all that and I must say that your list of books here are great reads as well as great on more information providers. I have a small business and I think your books are great to help promote them. While I’m sure Joel, “The Franchise King”, wrote the book for entrepreneurs and future business owners, I am recommending this work for everyone working the franchise space including marketers, operations, sales, and especially suppliers. You need this book if you’re even sniffing the idea of being a franchise owner. It will be the best money you ever spend. I believe Joel’s book is the best I’ve read on the steps franchisees need to take in order to properly research franchising and how best to lower risk in the process. These are great list of books! I have already purchased Engagement from Scratch an it really helps me in the business. Maybe after I finish reading this I will try the other books you recommend. Recently, I was catching up with a few friends and I must say that I was really excited about books that suggest ways and means to propagate small businesses like I have. I must say that the book list you have put here have got me excited and I hope to be able to read some of them and use the tips in my personal business. As a reader I am a fan of business books and was pretty excited to see your post. I have read “Business With A Conscience” and found it to be a stellar piece. I am sure that like the book I read which was of top quality even the other books on this list will also be at the same level. Am looking forward to getting my hands on the books soon. I find it really encouraging that Marketing with a Conscience ended up fourth in the Social Media category because that indicates there is growing interest in ethical business practices. There were over 200 (I wish I knew exactly how many but too busy to go count them) nominated and these were the ones I knew about or found early on. I will be adding more to this list as I only recently found out that Social Media ROI by Olivier Blanchard @TheBrandBuilder was nominated. Olivier is the ONLY person I have seen expound on the importance of Measuring Social Media ROI using timelines in evaluating social media impact and that is crucial. Analytics is highly misleading the way most people go about it and that results in them making bad decisions that really hurt their businesses. I did not think to look for his book because I thought it had been out more than a year. Only books published during a specific timeframe are eligible to be nominated. No doubt there may be other exceptional books that were nominated or missed being nominated. I encourage anyone who has particular favorites to share them with me. Nice Collection! I’ve read the “Duct Tape SEO” Book: very useful tips! Do you know whether a book of the founder of “37signals” is nominated? Perhaps “Re:work”. That’s my favorite book of the last years. Only books published in the previous year are eligible for that year’s awards. 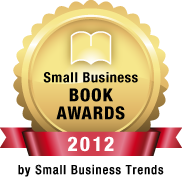 Re:work may have been nominated in previous years, but not all the connections of excellent small business related books know about the awards. They should – but they may not. The book “How to Sell Through Networking and Referrals” will be useful for the present and the future online marketers. This is the famous saying of the book “If you want to grow your business….get Recommended!”. so in online marketing people needs trust on them and that can be done by recommendations. I am an avid reader and am really excited by the book list you have put up. I can read almost everything and anything. I will be surely buying your book list and am looking forward to learning a lot of helpful tips when it comes to managing my small business. Thanks for this post, seems very well worked out. I know Anita Campbell, she’s a regular contributor at sba.gov which helps small businesses become successful! Great collection of books too! I am just wondering why there isn’t any book which helps us to boost online business or e-commerce! 🙁 Anyways a few helped! Many of the books are specifically about boosting online business such as Marketing Shortcuts which I nominated specifically because it provides specific strategies a small business owner can implement. How to Evaluate an Ecommerce Store (for affiliates – but an ecommerce store owner can use the points to improve their own store and increase their sales and conversion rate). There is a ton of great information on increasing ecommerce sales. Your highest priority is to improve your conversion rate. Look for Bryan Eisenberg’s excellent book Waiting for Your Cat to Bark. You will need to either hire someone who knows conversion testing or learn to do it yourself which is much easier now than it used to be. I am one of about a dozen collaborators who will be working together to use and share what we learn using Experiment.ly. I do agree on some tips that you have shared for small businesses. Glad to be able to run over on this page. Just wanted to add one more thing I was reading through the comments and notices you could review other short books, my father wrote on on timeshare real estate, awesome tricks for anyone who wants out or cant justify the cost. Its called Timeshare Whisperer. Who does he send the ebook to? Duct Tape SEO has my vote, nice cheap ways to get er done. I’ve been doing this for a bit now and its starting to pay off. I just downloaded the Danny Iny book and am about to get into it and there’s an interesting trend I notice…the option of buying books in physical form yet being able to download for free?! I read Digital Impact, and I would stay it’s a must have! I learnt so much and it totally changed my way of working! Wow — what a great post. These all look like wonderful books. I want to tell you how much we really appreciate your being a Media Partner of the Small Business Book Awards – honored in fact! And thanks to everyone who left comments here — how nice of you. Here’s to the winners! Just a bit over one day left to go. These books seems a good read. I will vote all the books that you mentioned and check this later on my google cloud reader. I like all the list in here..Thank you for sharing this to us..Looking forward to buy some of this..
What an amazing list, I really hope you win! I voted for all of the picks you mentioned as of today! Thank you so much for taking the time to support the authors and spread the word about books to benefit small businesses. These all look like great reads… books like these are so inspiring for those of us in small business. Awesome list! Great list of books and inspiration for small business owners. Sure, many entrepreneurs will learn how to improve their marketing skills after reading these books. I just finished reading this book ‘Become a franchise owner’ by Joel Libava. I must say what an inspirational and well thought out guide to starting up a business. I mean obviously it can’t provide all the answers for you but the strategies and considerations it promotes are nothing short of sound advice. A worthy read. Finally there is a book that gets into the nitty-gritty of what you have in store for you if you go down the franchise path. Thank you so much for that really nice recommendation! May I use your comment on my book website? It’s a shame I couldn’t get my book How To Be Lucky into the nominations on time. It’s about how I changed my life from a homeless teenager to become a successful entrepreneur and it contains loads of great advice for small businesses and anyone with an entrepreneurial spirit. Good luck to all the authors nominated. Would you be interested in writing a guest post here – a how-to about your experience using LuLu to publish your books as print on demand books? That would be very useful and of great interest to my readers (and me). I encourage guest bloggers to include all relevant links. I just looked at LuLu and am deeply disappointed that their only affiliate program is on Google. That makes them a whole lot less interesting because the less Google the better. Why in my There is No Google Fairy post. A great resource of books for small business owners. Having read Andy Lopta’s book I can highly recommend it. (Excuse the pun)! The Duct Tape SEO caught my eye. Read up on it and it sounds like something I should pick up. Goes to show how a good title can grab certain people. Because man I love duct tape. Thanks for the list! So many good books so little time :(.Wish i had time to read them all,but for now i think i will start with Marketing Shortcuts for the Self-Employed. Thanks for sharing this awsome list. These are great list of books you have compiled, I’ve notice that all the books talks about small business and worth a read, for us to base our experience, and maybe one time it will make us successful in our own endeavor. This list that you compiled is really great. I see several books here that interest me. Tweeting this right now. Thanks for taking the time to comment. Definitely check out Duct Tape SEO which is specifically for WordPress bloggers and Marketing Shortcuts. Which book will have the most impact for me if I want to do my own web marketing? Digital Impact or Marketing Shortcuts for the Self-Employed? I will definitely be checking out these books though because I am looking to grow a small business. I don’t have a review copy of Digital Impact so I can’t compare them; however, I can strongly recommend Marketing Shortcuts because the advice in it is can be implemented immediately. Are you aware the domain you linked to has expired? If you don’t want to lose it you need to renew it right away. Did you notice the Duct Tape SEO Book I included? I’ve already heard about Anita Campbell as one of the great successor and contribution in small businesses she has achieved this reputation through her unparalleled experienced and understanding. Also with Ivan Taylor, Its such a pleasure to view this post and learned useful information and these shows that women are now on track in respect to their chosen career in life. What a nice list you have put together here! I’m looking extra close at Duct Tape SEO: WordPress SEO Done Dirt Cheap which I think seems to have great potential. Judging from reviews out there, it seems to be good for the beginner and have quite a few tips for the seasoned blogger as well. Does most of the books says same though? As far as I know most of the self-esteem books are such, so how are these? No, each of these books is totally different from any of the others. There are reviews of almost all of them that you can read to get a better idea of what each covers. I’ll take a look at some of these later since I’m always looking for new books to read. I highly suggest the book Rework if you have not read it. Very simple read, but it’s a great story. Thanks for the recommendation…:) awesome post! This is an awesome book set. I also saw a contest on incomediary.com about great books for entrepreneurs (i think they were 20 books that the winner will get all for free). Thanks for the list. Thank you so much for that really nice mention. Thanks for the recommendation, will surely pick one of the titles in weekend. Interesting set of books, but I liked also your closing sentence: there is nothing unethical about promoting affiliate links provided that it’s done in a correct and ethical way as you do. Why not? And Amazon is not such a good choice, also they pay pennies like their compeer Big G. The bigger they are the lesser they pay. Have a great weekend Gail!